AIMS offers the Johnson County Online Mapping application as a service to the community of Johnson County to help promote e-government. You can create your own plot plan, view current and historic aerial photos of a property, search for property owner information, or view any of our hundreds of other geographic layers. In addition to the numerous publicly available datasets, AIMS also offers access to services such as CUE (utility data) and CERI (demographic data) for our data partners. This application is compatible with Chrome, Firefox, and Internet Explorer (8+) browsers. If you need help with Online Mapping, please visit our YouTube channel for videos that provide an introduction into the navigation and functionality of the application. In addition to this online help, AIMS also offers free instructor led classes to help users become more proficient with Johnson County Online Mapping. Please click here to view and register for upcoming classes. Lastly, if you have additional questions or suggestions, please let us know by contacting the Mapper Of the Day. The Address Web Service is an application developers tool. With the address web service you can validate an address or a full database of addresses against the county standard for addressing. If an address is validated by the Address Web Service the X, and Y coordinates of the location will be returned along with other information pertaining to the address. 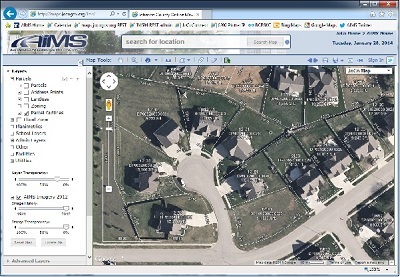 Having the X and Y coordinates allows a developer to do on the fly geocoding with the Address Web Service. To access the address web service please click here.